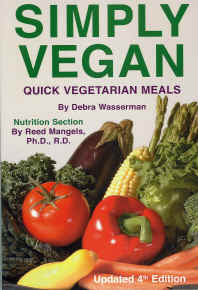 Simply Vegan by Debra Wasserman is simply wonderful! This is not just another cookbook. In this one comprehensive resource you will find the answer to just about any question you may have about healthful vegan living, as well as easy, nutritious, delicious recipes. I enthusiastically recommend this book for everyone, especially busy people! · Over 160 vegan recipes that can be prepared quickly. · An extensive vegan nutrition section written by Reed Mangels, Ph.D., R.D., on topics such as Protein, Fat, Calcium, Iron, Vitamin B12, Pregnancy and the Vegan Diet, Feeding Vegan Kids, and Calories, Weight Gain, and Weight Loss. A Nutrition Glossary is provided. · Sample menus and Meal Plans for Vegans. · Food Definitions and Origins including common and uncommon vegan foods, as well ad Herbs and Spices. · Cruelty-Free Shopping including where to buy vegan food, clothing, cosmetics, household products, and books.